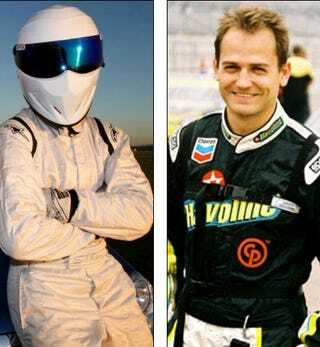 Some say Top Gear's elusive masked driver is former Formula Three driver Ben Collins. Some say the Sunday Times unmasked Collins today based on the financial reports of his company. All we know is... they're apparently right. Told ya so. For years the identity of BBC TV's Top Gear test driver, the Stig, has been the subject of frenzied speculation. Now his identity appears to have been revealed and shattered by his plan to publish his memoirs. The name of the driver who hides his identity behind a white helmet was revealed today as Ben Collins, 35, a former Formula Three driver. He was a double for Daniel Craig driving James Bond's Aston Martin in Quantum of Solace. Collins, who describes himself on his website as boasting "a reputation for being fast and aggressive," has long been a favorite name bandied about as the masked driver. Last week, the BBC confirmed it was trying to put the brakes on the Stig's planned autobiography, saying it breached "agreed contractual and confidentiality obligations" relating to the programme. Today the Sunday Times named Collins based on the financial reports of his company, Collins Autosport. In December 2003, a month after the new Stig's first appearance –- an all white-clad driver replacing the previous "black" Stig -– a financial report noted the company recorded a "cornerstone year" based on "driving services provided for the BBC, mainly in the Top Gear programme". The document recorded it offered "good long-term prospects for continuing income". But this doesn't mean Collins is the only Stig. It just means he's likely been the "day-to-day" Stig, the driver they use to do most of their timing, potentially leaving openings for guys like Lewis Hamilton or Michael Schumacher to step in as a "special" Stig for publicity stunts. The Stig Is Michael Schumacher?